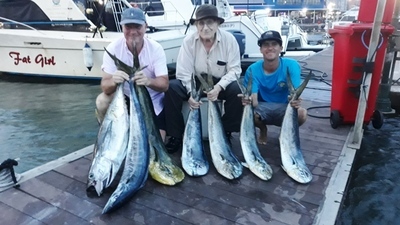 What a fantastic day out at sea with some superb fishing, and we only launched well after 8am with a father and son who landed in Durban this morning from the UK. The conditions were good with relatively flat seas and only a slight chop. 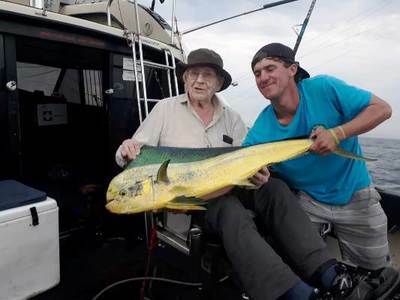 It was very special day for this Grand Dad of 92 to land 2 Dorado (Mahi) for himself, well done this is an awesome accomplishment and we are honoured to have shared this with you. Kevin well done on your Grand Slam, it is not easy to get a Dorado, Tuna and Wahoo in one outing and to be able to land them all yourself. A wonderful day with a Wahoo, a Yellowfin Tuna and 5 Dorado (Mahi) which made really made the Captains Birthday special.